At a Mobile Mondays meeting in Ann Arbor, Michael Antaran founder of Marvel Apps, was talking about the benefits of localizing AppStore Apps. That was enough to inspire me to give it a try. In the first part, I explained that we decided to localize Picross HD into three languages: German, French, and Japanese along with some of the lessons we had learned. Now that the localized versions have been in the AppStore for about a month, I thought it would be good to share the results along with some other interesting tidbits we learned. 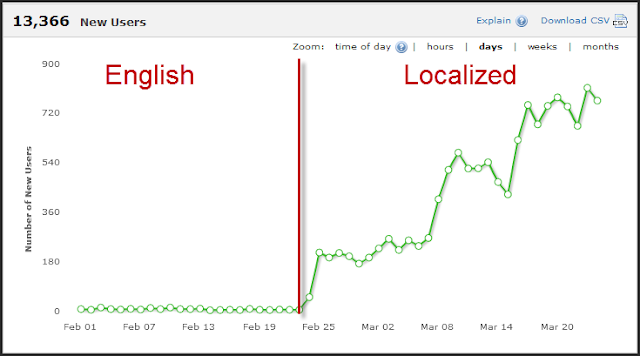 We didn't see any positive impact to new user growth for localizing in German. We did see a short term spike in new users for the French version, but after a few days it returned to its normal trends. I expected to see bigger results for localizing Picross HD into German and French. 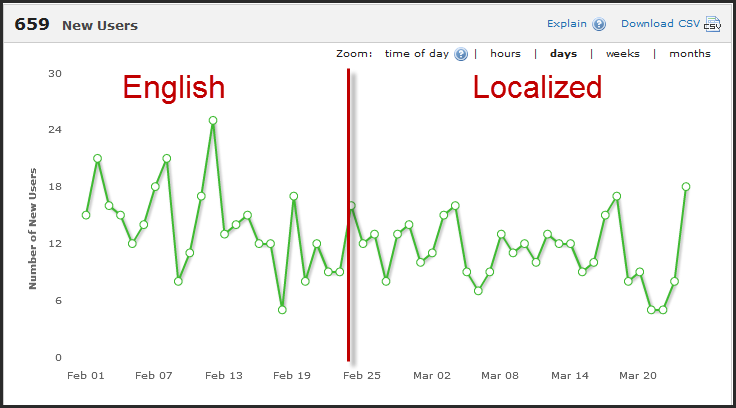 I would love to hear back on what other people have experienced when localizing into German and French. Are these results typical? Is English just not an issue in those countries for people using iOS devices for puzzle style gaming? We have had great growth in Japan sense we localized. Japanese New User acquisition is allmost an order of magnitude greater then all other locals combined. And it continues to grow. I want to say thank you to all our new Japanese users. Why the great growth? Well for starters, I believe Picross as a game style is better know in Japan then it is in other parts of the world. We also totally overhauled the Keywords for Japanese. We used keywords that would be meaningfully for the Japanese people. Even with all that, this totally exceeded my expectations. Almost all of our games are Universal apps, and we usually see close to 50/50 spread across iPhone and iPad usage. For example, in Germany about 55% of Picross HD sessions are run on an iPad. However, in Japan that number is about 4%. We where surprised about that difference. What have other people seen for iPhone vs iPad usage of their apps in different locals? We want to continue to experiment with different locals. The next version of Picross HD, which is pending Apple approval, will include support for Korean. We took a similar approach to Korean as we did for Japanese by providing local specific keywords so that should be interesting. We have also been working on some major updates to Picross HD given its new found growth. All the puzzles in the next version will have unique solutions and be solvable by logic. That should help address two of the big feedback items we received from our Japanese users. We are also looking at how to make the iPhone version even better. Much of our focus has been on the iPad version, but with this much usage on the iPhone we are going to have to pay even more attention to the iPhone version. 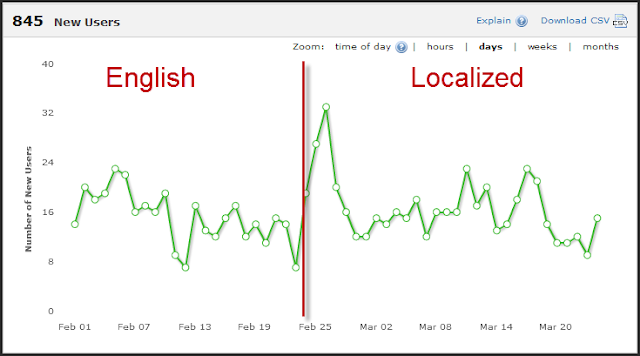 For better app localization results you can use software such as https://poeditor.com/.